State DOTs like to justify hugely expensive highway-widening projects, like Milwaukee’s $1.7 billion Zoo Interchange, partly on the grounds of safety. But if we really want to get a big bang for our transportation safety buck, fixing city streets makes a lot more sense. 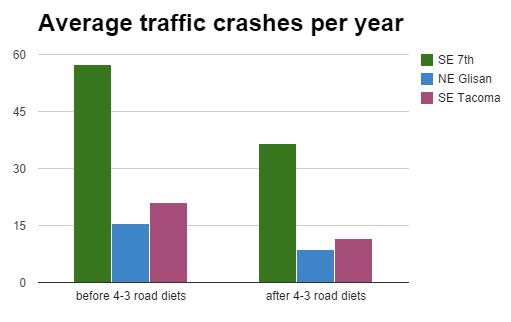 A new city study shows the big payoff the city has quietly seen from a few uses of one of the least-understood tricks in traffic engineering: the 4-3 road diet. Converting four general travel lanes to two plus a turn lane and (in some cases) painted bike lanes have prevented about 525 crashes on three Portland streets — Northeast Glisan from 22nd to 32nd; Southeast 7th from Division to Washington; and Southeast Tacoma from 6th to 11th — during the 16 years studied, the analysis released this week found. The number of traffic crashes on those streets dropped 37 percent. Traffic volumes on those three streets, meanwhile, fell by an average 7.7 percent, suggesting that the safety and access improvements weren’t accompanied by major new burdens on drivers’ mobility. The number of crashes being prevented on each of those streets, of course, continues to rise: by about 37 more every year among the three of them. Now imagine if that money from the one highway widening project in Milwaukee was used instead to do 10,200 road diets. Elsewhere on the Network today: Seattle Bike Blog announces the opening of the city’s new Pronto bike-share system. Strong Towns shares readers’ stories of trying to walk to the nearest grocery store. And Forward Lookout shares some data detailing the declining rate of return on highway spending.